It may be dull and rainy, but that’s no reason to let it get you down. These 6 rain and trench coats will make you want rain! Choose something that works for your colouring and shape. This animal print raincoat would work on any colouring and would be particularly good for an Apple or Coloumn shape. 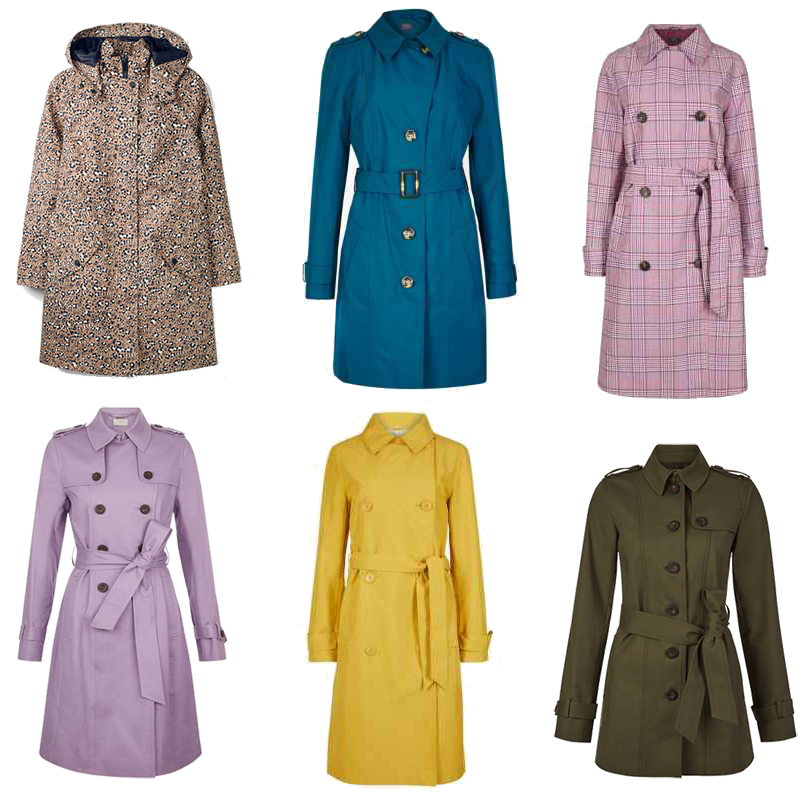 Teal is a universal colour that we can all wear, so this classic trench is good whatever your colouring. Because it is single breasted, if the top buttons are left open it will work on any shape. Use the belt to synch it in and emphasise a slim waist or remove the belt completely if you are Apple shaped. This check double breasted style will work well on Light, Soft or Cool colouring and those with a column or neat hourglass shape. Avoid a double breasted coat if you have a large bust. This lilac trench is so pretty. Choose it if you have Light, Soft or Cool colouring. But a Bright could also wear it with a bright contrasting scarf. It’s better on those without a large bust. Yellow works well on a warm skin tone and like the other double breasted styles, this coat is better on a smaller bust. Use the belt to give yourself shape or emphasise the waist. Another single breasted option, which if you are curvy, would look better with a few buttons at the top undone. This olive shade works on warm skin tones and it would also be good on a Deep, perhaps with a gorgeous red scarf. Previous Post New Ways To Wear Pink For Spring.